You can purchase four Kids Wings Nursery Rhyme Activities for Cindy Moo, Let’s Sing a Lullaby with the Brave Cowboy, The Dish Ran Away with the Spoon, Pocketful of Posies, and Sixteen Cows in the same, immediate 47-page download! All, sharable within your school! Only $12.95! The cowboy has a lullaby for his sleepy cows, but what happens when the he sees danger in the shadows around him? Will he scream? Will he run for his life? Will a big bad wolf go after his cows? You will be surprised at what really happens! Lori Mortensen's funny rhyming text combined with Jeff Mack's precious illustrations in Cindy Moo make this a story book that kids ask for over and over again. We suggest that you pair it with Sixteen Cows, another terrific story with cows, rhyming text, a problem, and a love story! 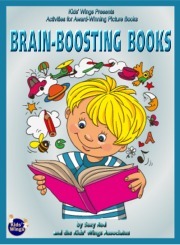 A 10-page literature guide, perfect for lesson plans, handouts, or projection on your electronic board for Let's Sing a Lullaby with the Brave Cowboy by Jan Thomas is part of the 2013 Literature Collection, Brain Boosting Books! Can You Tell What's Behind the Shadow? Buy Let's Sing a Lullaby with the Brave Cowboy by Jan Thomas NOW!